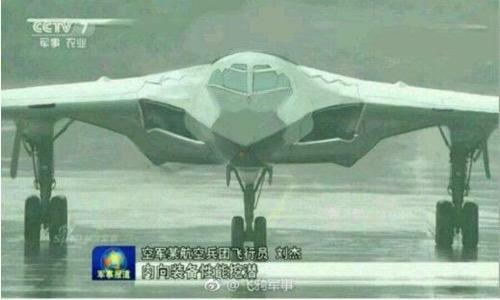 Imminent Trial Flights Expected Of Chinese Stealth Bomber - "Deterrence To Our Enemies"
Earlier this year, state-run Aviation Industry Corporation of China teased audiences worldwide with a promotional video offering the first official glimpse of the country's first stealth bomber. Now, it seems a popular daily Chinese tabloid newspaper has confirmed that the Hong-20, or H-20 is ready for trial flights. Song Zhongping, a military expert and TV commentator, told the Global Times on Tuesday that trial flights of China's next-generation stealth bomber would be immient. He said disclosing the new plane is a potential deterrence to our enemies. Shanghai-based news site thepaper.cn said, revealing the bomber's name before trials show strength in the Chinese aviation industry. In August, state broadcaster China Central Television reported in a documentary that "the development of new long-distance strategic bomber, Hong-20, had made great progress." The bomber marked the 91st anniversary of the founding of the People's Liberation Army, which Chinese officials see the stealth plane as a "game changer," could enter series production much sooner than estimated. The documentary was the first time "Hong-20" appeared officially in the public domain. "Hong" is the first character of Honghaji, "bomber aircraft" in Chinese. The public unveiling of the bomber suggested that Aviation Industry Corp. might have concluded testing of hydraulic pressure, electricity supply, and avionics systems, said song. "The trial flight will come soon," he added. Specifications of the new bomber are unknown, but it seems the Chinese did a great job copying the profile of the American Northrop Grumman B-2 Spirit stealth bomber, both look pretty similar. "Observers say the design objective is for the long-range H-20 to remain airborne for some 8,000 kilometers to jet away beyond the second island china - formed by Japan's Ogasawara and Volcano Islands as well as Guam and the US Mariana Islands in the middle portion of the Pacific -- without aerial refueling," said Asia Times. News Corp. Australia Network speculated earlier this year that the stealth bomber could reach northern regions of Australia, after taking off from Chinese militarized islands in the South China Sea. The Global Times quoted Fu Qianshao as saying the ultimate goal for the H-20 is to boost operational range to 12,000 kilometers with 20-tons of payload. Asia Times pitched the idea that the stealth bomber could be the solution for China to fire missiles at American mainland targets. Add next-generation stealth bombers to the list of military might that China is acquiring before a military conflict with the US breaks out.